I’m back from vacation, and thus the baseball banter must return. Here’s a six-pack of topics to get you ready for the final week of the 2017 regular season! Just three spots remain up for grabs in the 2017 Postseason. While the AL East has yet to crown a winner, both the Red Sox and Yankees have clinched postseason berths. Only the NL Central remains in play, though the Cubs are 5 1/2 games ahead of the Brewers with only 7 games remaining; FanGraphs gives them a 99.8% chance of winning the division. As expected, the race for the second wildcard spot is coming down to the wire, though not in the league we expected. Just a month ago, SEVEN teams were within 3 games of the second wildcard spot in the American League. Now, the Minnesota Twins have a 4.5 game lead over the Los Angeles Angels with just a week to go. Angels fans may look at the schedule with a glimmer of hope; the Angels get to play the lowly White Sox this week, while the Twins have to try and clinch against the juggernaut Cleveland Indians. The race for the wildcard could carry into the final weekend, but don’t expect too much fireworks. The Twins finish with a three game set against the Detroit Tigers, a team they swept this weekend by a cumulative score of 27-11. Flying into October: Bryon Buxton’s .304/.354/.571 and 24 defensive runs saved in the second half of the season have the Twins on the brink of the playoffs. 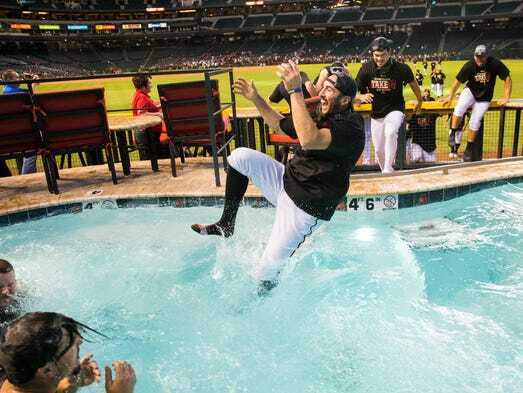 What for most of the season looked like a surefire wildcard match-up between the Diamondbacks and the Rockies has become more questionable. The D-Backs have clinched, but the Rockies slumped to a 2-4 record over the past week against weak competition. They’ve opened the door for a pair of NL Central teams: the Brewers, who are two games back, and the Cardinals, who are 2.5 games out. FanGraphs gives the Rockies a 77% chance of winning the second wildcard spot, and who am I to argue with the sabermetric experts? If the Rockies don’t take care of business against the Marlins mid-week though, the weekend series between the Cardinals and the Brewers could be must-see baseball. And the Nationals…well, we’re not really sure what the Nationals are doing here with this Games of Thrones-inspired look. Yes, that is Jayson Werth and Bryce Harper dressed up as Jon Snow and a Direwolf. I for one wanted to see Max Scherzer as a White Walker; guess I’ll have to wait for the World Series celebration for that. Baseball players are crafty. They try to substitute a potato for a baseball to fool baserunners. They try to frame pitchers that are juuuuuuust a bit off the plate. They untuck each others’ jerseys in order to gain a competitive advantage. But the pièce de résistance of baseball trickier remains the hidden ball trick. On Friday night, Blue Jays 2B Ryan Goins pulled off one of the best. The best part about the video is that the Blue Jays’ broadcasters don’t even know what happened until midway through the video. Goins would add a grand slam in the sixth inning, pushing the Blue Jays to an 8-1 victory. We’ve already seen a number of home run records fall this season. Cody Bellinger broke the record for most home runs by a National League rookie with his 39th dinger of the season. For only the second time in history two players hit four home runs in a single game (Reds 2B Scooter Gennett, on June 6, and Diamondbacks RF JD Martinez, on September 4). And across all of baseball, the 2017 season has seen more home runs than ever before. A new record for most homers hit in a season – EVER. With a week to go, will any other long-ball records fall? With his two dingers on Sunday Aaron Judge brought his season total to 48, just one shy of Mark McGwire’s rookie record set in 1987. For a guy who’s already had six multi-homer games in his short career, two home runs in a week seems reasonable. At the top of the home run leaderboard, Giancarlo Stanton stands alone on 57 home runs. Will he match Roger Maris’ mark of 61? (Which, to be clear, is not the record. But it’d still be pretty cool if Stanton got above 60.) He has three games in Coors Field this week, so don’t be surprised if Stanton gets close. Our first casualty of the 2017 season comes as no surprise: Brad Ausmus will not return to manage the Detroit Tigers in 2018. Can’t blame him for trying: Ausmus was unable to stop the inevitable decline of the Tigers’ aging roster. Ausmus has managed the Tigers for four years, taking the team to the postseason just once in his tenure. He put together a 312-328 record during his time in Detroit. The move clearly comes as a part of the Detroit Tigers rebuild. They’ve traded away most of their star players in an effort to cut payroll and accumulate prospects. With the team set to finish in the AL Central cellar, GM Al Avila decided it was time for a change. The Tigers are making the right call here. They’re settling in for a long rebuild, and before they can build it up again they have to tear everything down. Bringing in a new manager who excels in developing younger players and turning prospects into stars can hopefully help hasten the rebuilding process. As for Ausmus, he had the cards stacked against him in Detroit. He followed a beloved manager in Jim Leyland, and inherited a team that was well past its prime. He did well to drag the team to the postseason in 2014, and to keep them in the race well into September in 2016. Ausmus has the baseball acumen and personality to be a successful manager, despite the struggles in Detroit. He deserves a shot with another club. Speaking of the Tigers, they were on the wrong end of one of the most embarrassing plays of the 2017 season: an inside-the-park home run…on a bunt. The Tigers settled down and played the Twins close…until the bullpen gave up eight runs in the eighth inning. For Tigers fans, the end of the season can’t come soon enough. Last season Colin Kaepernick sparked a nationwide discussion over race, the flag, and the national anthem when he remained seated during the Star-Spangled Banner. Other NFL players soon joined him in taking a knee in protest of continued racial injustices against people of color. The sports world was largely unanimous in their criticisms of Trump’s comments. Nearly 150 NFL players took a knee during the anthems on Sunday. Other teams like the Seattle Seahawks and the Pittsburgh Steelers remained in the locker room during the anthem. Lebron James even called the president a “bum” after he disinvited Warriors point guard Stephen Curry to the White House. 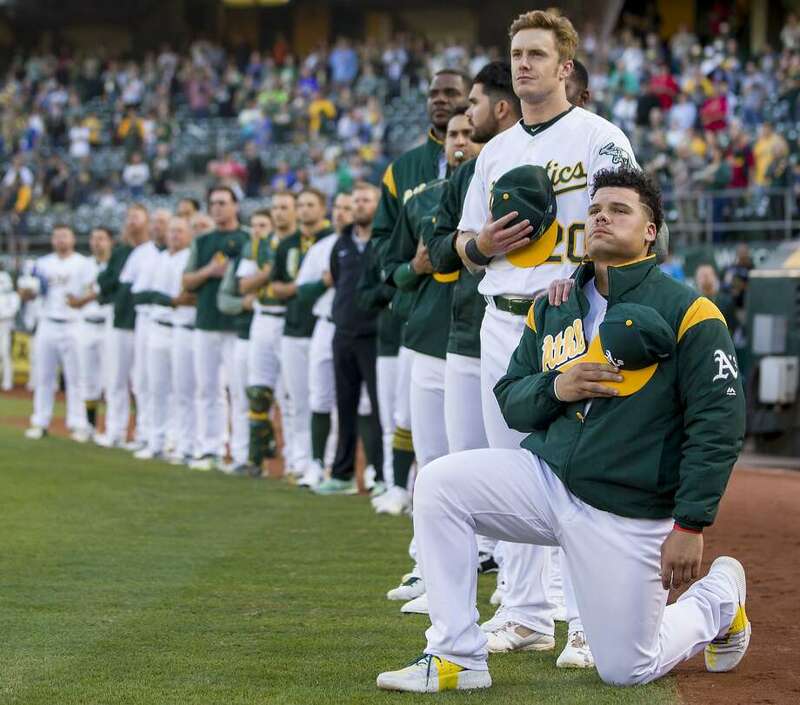 In baseball, Oakland Athletics catcher Bruce Maxwell became the first person to take a knee during the national anthem. Maxwell becomes the first player in Major League Baseball to join the anthem protest. Maxwell grew up in a military family in Huntsville, Alabama, where Trump gave his campaign speech. After the game, he addressed his protest. There’s a lot to get to in this issue, particularly with it’s relation to the great game of baseball, but the simple point is this: Maxwell, as an American citizen, has the right to peacefully protest and express himself. Those who believe he is disrespecting the flag and America’s veterans (despite the fact that Maxwell himself has explicitly stated that is not his purpose) have the right to believe that, and to express that belief in a peaceful manner. Matters of racial injustice, prejudice, and honoring the flag are complicated; the right to freedom of speech and expression is simple. Midweek: The Cubs travel down to St. Louis looking to punch their ticket to the postseason as NL Central champs. The Cardinals will likely need to sweep the Cubs to have any chance of making it to October. They’re putting their best feet forward early, with young stud Luke Weaver toeing the rubber on Monday and staff ace Carlos Martinez pitching on Tuesday. Weekend: Lots of good options over the weekend. 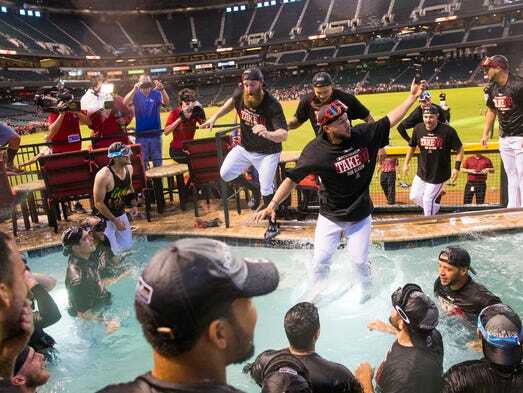 If the Rockies stumble during the week against the Marlins, the 3-game series at Busch Stadium between the Brewers and Cardinals could decide the NL wildcard. If the Twins can’t take care of business against the Indians during the week, they’ll look to secure a postseason berth in a home series against the Tigers. Once the postseason races are decided, turn the TV over the Fenway Park, where the Red Sox host the Astros in a likely ALDS preview. Also, Standing Room Only will soon be available in podcast form! Brett and I are finalizing details on our podcast, which will be available as soon as Brett fixes his computer (I’m being completely serious). Soon we’ll be able to annoy your eardrums as well as your eyeballs! Watch this space for more. Next Post: Baseball Takes A Knee…Will It Take A Stand?